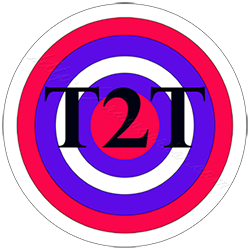 The treat to target (T2T) approach involves defining a treatment goal or “target” and modifying the therapy if the target is not reached. Treat to target (T2T) is an approach to treating Rheumatoid Arthritis / Rheumatoid Disease (RD) that combines aggressive or intensive treatment with disease modifying antirheumatic drugs (DMARDs) and regular monitoring of disease activity (DA). The goal of treat to target is to achieve a “target” of clinical remission or low disease activity (LDA). Experts agree the ideal target in RD treatment is remission, defined as “the absence of signs and symptoms of significant inflammatory disease activity.” However, in some circumstances, LDA is chosen as an alternate target. There are various definitions of remission (or LDA) according to various DA measures, and unfortunately, clinical remission or LDA does not mean that all symptoms are necessarily eliminated. Research will continue to improve both treatment strategies and medications, so that hopefully complete remission will become more realistic for everyone with Rheumatoid Disease. How does Treat to target work in Rheumatoid Disease? T2T can result in lower disease activity levels for people with RD, which can mean less pain, disability, and damage. Which methods of measuring disease activity are used in T2T? Patient reported outcome measures are used in combination with swollen and tender joint counts and blood tests to create instruments such as the CDAI (Clinical Disease Activity Index), SDAI (Simplified Disease Activity Index), DAS28 (Disease Activity Score in 28 Joints), and RAPID3 (Routine Assessment of Patient Index Data 3). Whichever instrument your doctor uses, what’s most important for PRD to know is that measuring DA is a valuable part of rheumatology care. Various imaging tests are also used to help assess DA, such as musculoskeletal ultrasound, MRI, or nuclear bone scan. However, these tests do not provide a clear DA score that is needed in T2T. 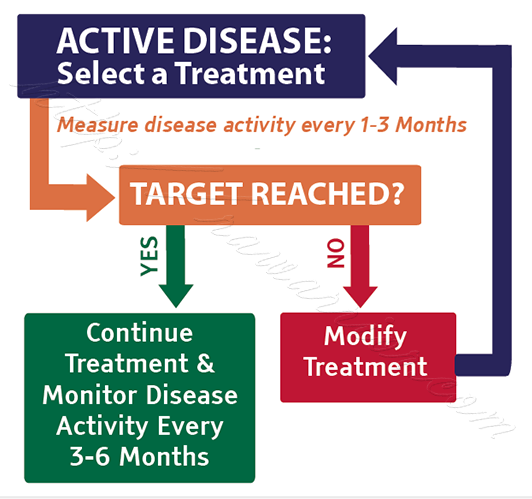 Disease activity is measured more frequently (often monthly) for patients with high or moderate disease activity. DA is measured less frequently, such as every 3 to 6 months, for patients in sustained remission or low DA. NOTE: The Rheumatoid Patient Foundation has brochures available on Treat to Target and other topics – click here to view. I have had RA for 20 yrs. have tried every med that has come out. I have never been in remission. I continue to have swollen joints, pain & nodules that I have to keep having surgery b/c they are painful & interfere in my daily life. The nodules continue use to come back ! I have a very good & kind rheumatologist & we try everything g together. I just plug along daily & count my blessings I am not in a wheelchair yet. I try to stay positive & not think about the things I don’t get to do. In a meeting at the National Quality Forum in DC, I just heard a presentation about Treat To Target by Northwestern’s Amy Eisenstein. Given all the other things I’ve seen here about rheumatoligists, I love it. Any indication of how it’s working out in various patients’ perspective?